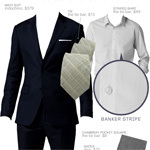 A handy tool for buying the best suit. With Combatant Gentlemen's low prices one lucky winner is going to be getting a ton of new wardrobe staples. Bold patterns and color palettes can look great, but never underestimate the power of being understated.